A staple in the Qinghai-Tibet highland plateau, highland barley is grown in profusion. It is one of the only crops that can be cultivated in this climate harsh region. 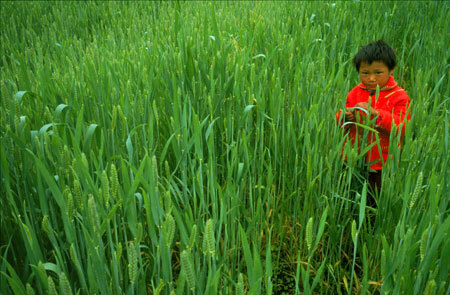 Tibetans use the highland barley as a food staple and to brew a popular liquor. Very far away on the road, I noticed a little dot of red clothed child in the green highland barley field, I formed the picture in my mind instantly, before zigzagging through the deep field of growths to bridge the distance.